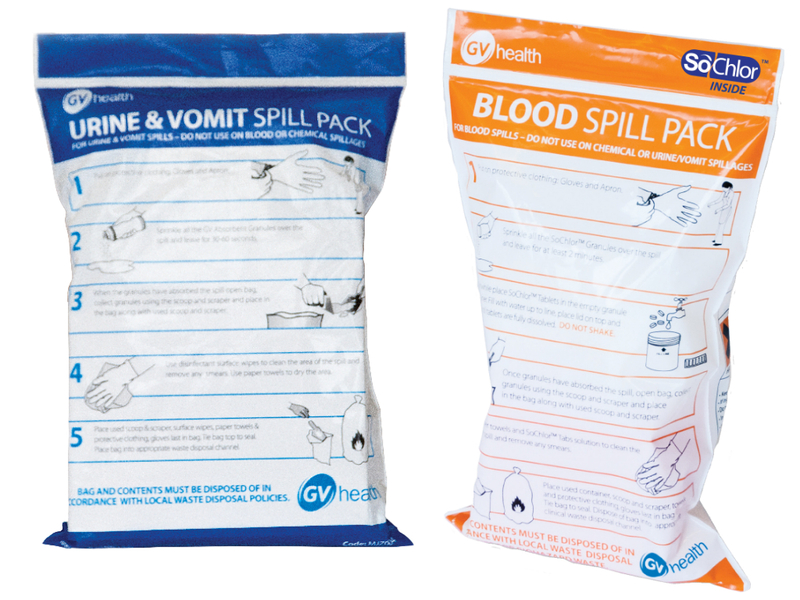 GV Health Blood Spill and GV Health Urine and Vomit cleaning packs are used to clean and decontaminate areas where spillages of blood, urine and vomit have taken place. They are safe for use by non-specialist staff and include personal protective equipment for users as well as specialist cleaning/decontamination agents. Packs can be purchased for stand-alone use or as refills for complete biohazard spill kits (ref. MJZ002). GV Health Blood, Urine and Vomit Spill Packs contain SoChlor NaDCC Granules and SoChlor Chlorine Tabs. SoChlor NaDCC Granules: SoChlor Granules are intended for use against spillages of blood. Fast acting granules absorb the liquid so it can be safely collected and disposed of while releasing a powerful disinfectant which kills any pathogens contained in the spillage. SoChlor Chlorine Tabs: SoChlor Tabs are formulated using Sodium Dichloroisocyanurate (NaDCC). Chlorine solutions made from NaDCC are effective when deployed on organic matter such as blood. Diluted to 10,000ppm SoChlor Tabs meet the recommended strength for blood spill disinfection as stipulated by the World Health Organization(WHO).